(Newser) – First came the theory, then a dribble of updates: In August 2015, University of Arizona archaeologist Nicholas Reeves made the case that Tutankhamun's tomb also holds the remains of Nefertiti. Egyptian authorities had no comment at the time, but three months later, a duo of stories seemed to lend credence to the idea, at least of a hidden chamber. A "preliminary analysis indicates the presence of an area different in its temperature than the other parts of the northern wall," announced Egypt's antiquities minister; further scans that month led Egyptian officials to say they were "approximately 90%" certain a previously unknown chamber is present. Now, the next step in the process has been established. 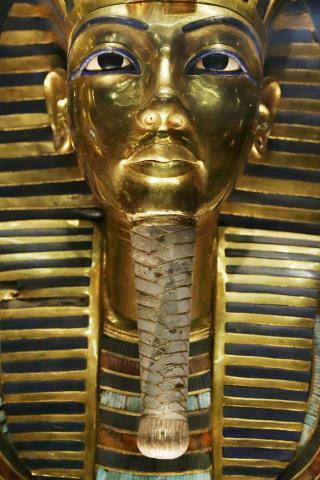 "We'll Soon Know If Tut's Tomb Holds Secrets" ? Buried in his Jammies! ? Will it hold the secret of why the commie leftwing news media are cheerleaders for the democrat party?